It’s time for our monthly Pinterest Challenge Blog Hop! This blog hop encourages us to not just pin, but to actually try out some of those pins we’ve been collecting. 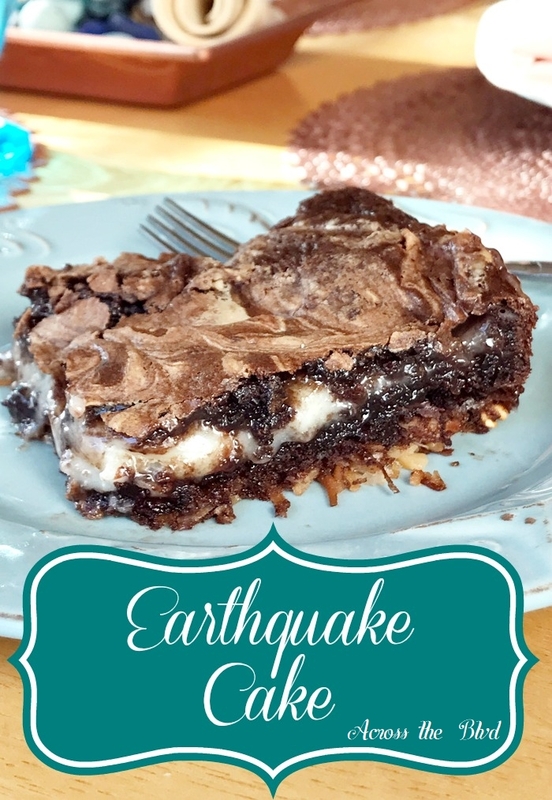 This month, I’m sharing a recipe for an Earthquake Cake. 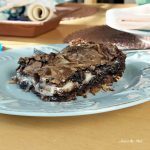 It’s chocolate and gooey, and easy to make. I’ve had this pinned for quite a while and I’ve been curious about it. My Pinspiration can be found here. The recipe was shared by Beth from The First Year. I thought if if tastes as good as it looks, it would be a win. I planned on baking this and I thought I had all of the ingredients. I didn’t have pecans though. I did have a can of mixed nuts, so I broke those into pieces and used them for the bottom layer. The name of the cake caught my attention when I first saw it. It gets its name from the ingredients shifting around during baking. Making this is easy and it doesn’t take a lot of prep time. 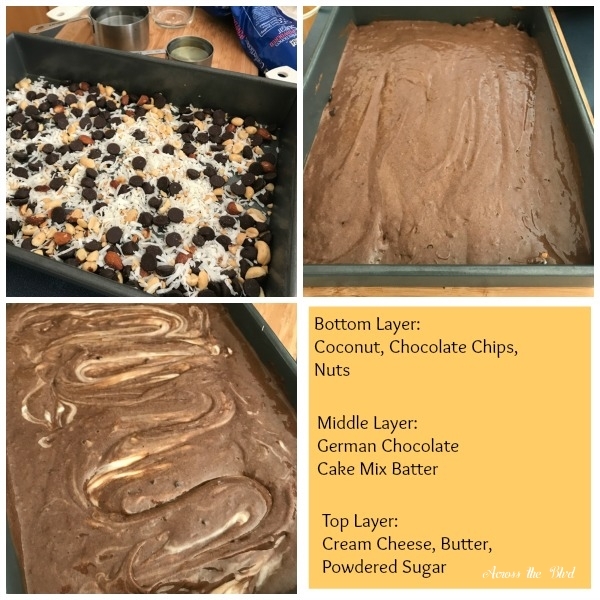 a 9 x 13″ pan is sprayed with non sticking cooking spray and the mixture of coconut, chocolate chips, and nuts is sprinkled into the pan. The cake mix batter is poured on top of that and for the top layer, melted cream cheese and butter are combined with powdered sugar and swirled into the batter. The cake is baked for 35-45 minutes in a 375 degree oven. I checked mine at 35 minutes and it was still a little too jiggly. I left it for five additional minutes. Mine didn’t turn out as pretty as the Pinspiration photo. I think I didn’t swirl the top layer close enough to the sides or have the swirls far enough apart. I was a little skeptical of the cake right out of the oven. It just did not look very appetizing. It takes a lot for me to not see any kind of chocolate cake as anything less than appetizing. I sliced what I was hoping was a square and it wasn’t what I expected. Even though I knew it was meant to be gooey, I thought it would hold together better. It looked more like a mound of gooey chocolate than a square slice. I’ll spare you the picture of that. It was a hot mess. I was about ready to call this recipe a fail until I took a bite and I changed my mind. It’s rich and very sweet, but I didn’t think it was a total fail. I sliced it while it was still warm from the oven because there were lots of comments about how great it is while it’s still warm. I’m going to have to disagree with those comments. Not only did it come out in more of a blob than a slice, I didn’t taste the coconut at all. After I allowed it to cool to room temperature, not only did it slice easily into a square serving, the combination of flavors came through. The coconut is subtle, but I could tell a big difference from the bite I had while it was still warm. Spray a 9 x 13" pan with cooking spray. Sprinkle mixture of coconut, chocolate chips, and nuts into pan. Mix the cake mix, oil, water, and eggs in mixing bowl. Beat on low speed with electric mixer until well mixed. Pour batter over the top of the coconut mixture. In a saucepan, melt butter and cream cheese on medium to low heat. Once melted, pour into mixing bowl. Add one half of the powdered sugar to melted butter and cream cheese. Mix on low speed until combined. Add the remaining powdered sugar and continue beating on low until the mixture is fluffy. Spoon the mixture onto the cake batter and use a large spoon to swirl the mixture into the batter. Place in oven and check after 35 minutes. If it still jiggles in the center allow it to continue baking for an additional 5 minutes. Allow to cool to room temperature before slicing and serving. Store any remaining cake in the refrigerator. While this is tasty, it was a little too sweet. I think the amount of powdered sugar in the original recipe could be cut in half and the amount of coconut should be increased. I made those changes for my recipe card above. Overall, I’d say this was a Pinterest win. 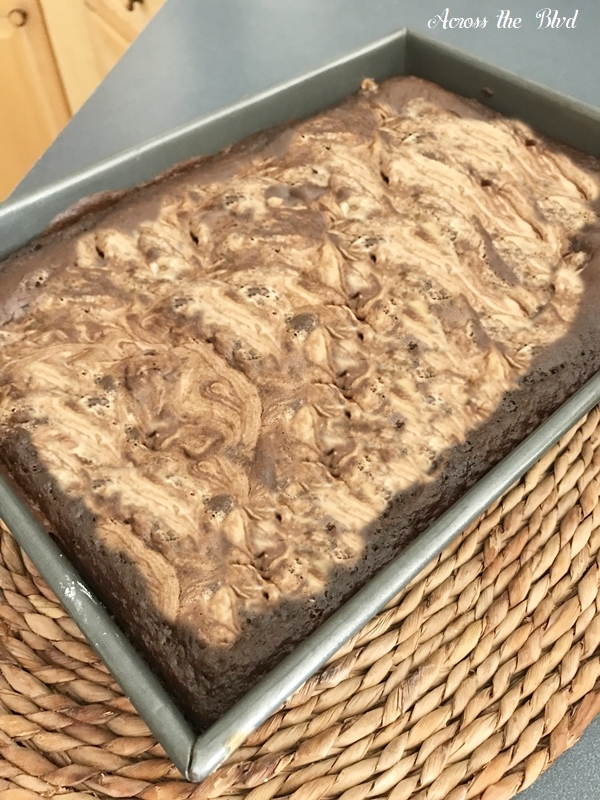 It’s certainly not the prettiest dessert you can make, but with a couple of changes to tweak the recipe, I’ll make it again. I’m thinking this doesn’t look as bad as you think! Looks delicious to me! I find a ot of recipes are too sweet for me too but I guess that might just be personal taste. I feel very sorry for you and your family now, you will be forced to eat tasty chocolate cake over and over as you tweak this recipe to perfect it!! I guess I expected it not to have a sunken look to it! Thanks, Julie. I took most of the cake over to my brother’s house. It was quickly consumed! I love the gooey look of this cake. I’m glad you gave it another chance after it cooled. It does look yummy! It’s definitely gooey! I was glad that I let it cool and cut it again. I really didn’t want this to be a fail! Thanks, Jenny. Ha! I do that all the time. I wouldn’t know how to cook if I couldn’t make substitutions! So, did the ingredients really shift around while baking? I’m not sold on it by the way it looks, but if you say it’s good, I’ll take your word. It does look like a mess and I would be afraid to make it for guests. They would probably think that I failed in making it, somehow. I like that it has cream cheese and nuts but that’s about it. Sorry, Beverly! That sounds like chocolate cake meets magic cookie bars… and I rather enjoy both of those desserts. I might have to try this! Pinned. It is similar to both of those. I hadn’t thought of that. Thanks so much for pinning, Joanne! The name is kind of funny, but it looks totally delicious! I was curious about the ingredients and have to say there is nothing in this cake that would give me pause! I’m pinning so I can add this to the must try list! Have to say that it looked more difficult than it actually is, so it’s my kind of recipe! Thanks for sharing it. Pinning and sharing! Thanks, Laurie! I love all of the ingredients, too. I wish it were a bit firmer, but I guess that doesn’t matter as much as the taste! Thanks so much for pinning! Let me know if you try it and how it turns out. This looks heavenly. Really, really delish. I have pinned it…you had me a chocolate, coconut and nuts! Throw in cream cheese and what’s not to love. If my cake doesn’t bake up pretty, I can always close my eyes while I eat every sinful bitE!! Thanks so much for pinning, Leslie! Those are some of my favorite ingredients, too. I like the way you think! Who needs all cakes to be pretty? Saw the pic and knew this was my kind of dessert. Love the gooey mess. Thinking some vanilla ice cream on top of slightly heated Earthquake sounds like a sweet sugar high. Oh my…. Glad you added what you liked and how you would adjust recipe. I’m not a baker so would be nervous to make any changes. It’s certainly gooey and messy! Oh, vanilla ice cream might just be a perfect topping for it. Tweaking a recipe can be a bit of trial and error, but changes I suggested are pretty simple ones. Thanks, Kelli! Looks delicious! This would be a fun dessert to make with my twin daughters. Thank you, Lauren. It’s a tasty dessert! The cake looks yummy and sweet, so the changes you suggested would be perfect. I keep thinking about a scoop of vanilla ice cream on top of the warm cake lol Pinning!! Thanks! I hadn’t thought of adding ice cream until it was mentioned in the comments! Now, I want to make it again soon to try it with ice cream. Thanks so much for pinning, Lisa. You are a woman after my own heart! Just use the nuts you have! That is me too! Those not so pretty desserts are always the best! I once made a Pinterest recipe for some sort of Ooey Gooey Bars and they were awful, I wouldn’t even discuss that with my own daughters! I should try again. I probably did something wrong. I think that slice looks scrumptious! That’s the way I often “follow” recipes! Taste is more important than presentation to my family, so they didn’t mind how it looked. I’ve had a few of those fails, too! Thanks, Shirley! This cake has everything in it that I love. Looking at the picture is making me hungry. It does have tasty ingredients! Thanks, Debra! This does look gooey and delicious! Although it would probably put me in a coma since I don’t eat sugar! Thanks, Roseann. For those of us who can eat sugar, it’s definitely a tasty treat. The cake looks decadent! And I love the name – Thanks for sharing your great recipes at the What’s for Dinner party. Thanks, Helen! It was very rich and definitely a sweet treat. Thanks for the party! This does start out with a very intriguing name. I love that you are actually trying some of your pins. Pinning to pinterest reminds me of the days when my mother cut out recipes from magazines and made only a few of them. they all look so good but making them is another feat in general. I think that this cake sounds delicious and I definitely need to try it. 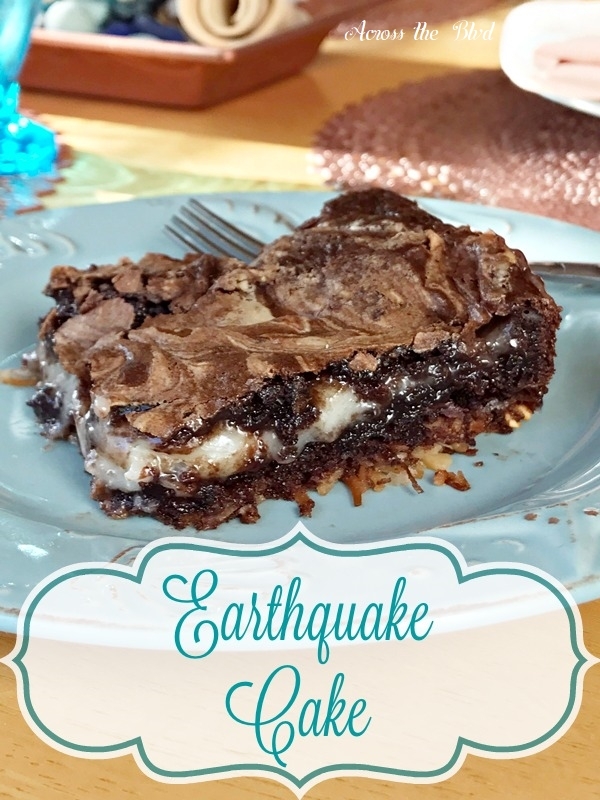 Thanks for sharing on snickerdoodle create bake make link party. This Pinterest Blog Hop is definitely a motivator to actually try out some of our pins. My mother did the same thing. Lots of pretty pictures, but not often made. Thank you, Amy. I bet this would be great served warm with ice cream. I’ve made a cake similar to this, but without all the added nuts & coconuts and the family liked it. Ice cream added to the top would be a delicious addition to the cake. My husband isn’t a big fan of coconut, so next time I’ll probably leave that out.